The new moon is the best way to redesign life project, through the vision of the fundamental aspects that at this time may, appear sharper and clearer. The new moon is the moon of the inner clarity, as opposed to the full moon, where the excessive are confusing and for this reason, at this stage, the ascended Masters approach the human level: so the full moon is cosmic inspiration. Now we are in the new moon, there is the human and his individuality, his freedom, his will. It ‘s time where listening to oneself is cleaner than usual but this silence can also create anxiety and dismay with some phobia, so someone is inclined to do too many things! You should understand however, that you are in total availability of things that you can do. Just want and implement the project of desire. 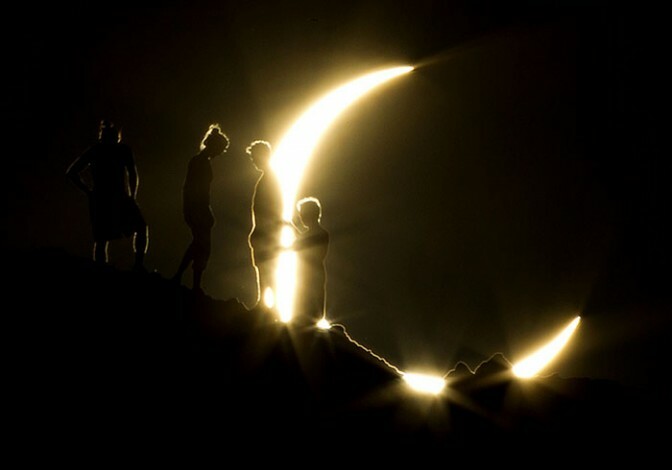 We consider that the solar eclipse empties its planetary symbolism in the event that we can imagine it as the representation of the personality. Also look at the astrological transits: squaring Uranus – Pluto symbolizes the revolution of social and alignment in Taurus brings together the sun, the moon, Mercury and Mars. We are talking about a geocentric alignment that is perceptible from the horizon of the Earth. This is also for the eclipse and then we can say that the interruption planetary also involves these planets that are linked to the symbolism of the communication / intelligence or the physical / impulsivity. What does this mean? The conjunction of the luminaries with the energy of Mars and Mercury is always very significant. On one hand, the planets are slowed down in their expression, on the other have no way, in this downturn, to express their intense practicality in creating materiality through an act slow but persevering, led by complete confidence. Slowed but realizes that this is the message. For every thought, every emotion. This moon is connected to the eclipse and then it will be essential to give greater importance because the eclipse is a dimensional portal that transports us twice, the first is in the moon, the second in the sun. That also means conveyed twice, past and future / future and past, putting in place the conditions that have led us into a reality and we now know that was made by our emotions, conditions, actions. We can fix and find a more appropriate reality: it is not this fantastic?